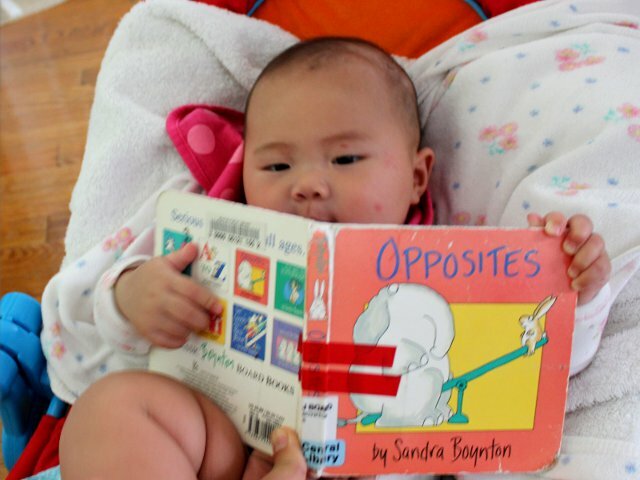 We have already read two books about opposites to Arya, so I was curious to see if she would like Opposites by Sandra Boynton more than the previous ones. Books about opposites have the same general formula and the Sandra Boynton version is no different. But rhyming text, distinct background colors and cute pictures make this version a good choice for young children. Opposites doesn’t have a plot or even a traditional story. Rather, text consists solely of pairs of opposites. Boynton uses a clever arrangement of pairs to maintain a simple rhyme throughout the book. Rhyming words help adults to read the book with more expression while older toddlers will be delighted by the sing-song tone of rhyming words. Fourteen pairs of opposites are spread across the 16 pages of the board book version of Opposites. Next to a single word description is a cute picture of a different animal demonstrating the concept. Some animals–like the tall giraffe or slow snail–are easy choices, but the best pictures are of more abstract terms like the two turtles demonstrating “in” and “out”. Each page has a different colored background in addition to a colorful illustration of a pair of animals. My four-month old baby really liked the changing background colors even though she didn’t seem particularly interested in the pictures of the animals themselves. Arya did like the picture with the heavy elephant and light rabbit on the seesaw although even that may have been because of the orange background. I thought the picture demonstrating “weak” and “strong” was the best as the matching expression of the two animals is well captured by just their eyes. Like most books about opposites, the Sandra Boynton version of Opposites is well-suited for a young age range. Babies will like the different colors and children who are just old enough to read the words on their own will enjoy the rhyme and the simple vocabulary. Older children will quickly tire of the book since there is no underlying story. Opposites costs (including shipping) under $6 new and under $4 used from Amazon.